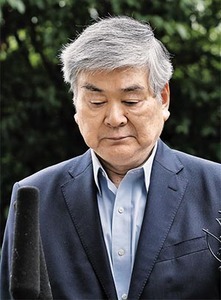 Hanjin Group chairman Cho Yang-ho, who died suddenly on April 8, was laid to rest on Tuesday after a funeral ceremony at Severance Hospital in Seoul. Speakers commemorated his contributions to the Korean airline industry and winning the bid for the 2018 Winter Olympics in Pyeongchang. Some 300 people joined Cho's scandal-plagued family for the funeral, mostly staff of his Hanjin Group empire. After the ceremony, the body was taken to the Korean Air headquarters in western Seoul, where he had spent most his life, so staff could say their last goodbyes. Cho was interred at the family's burial plot in Yongin, Gyeonggi Province.